We can produce almost anything you can think up. We have worked with individuals on a number of unique ideas. You can e-mail, fax or mail a drawing, sketch or specifications for your idea and we will quote you a price and delivery. 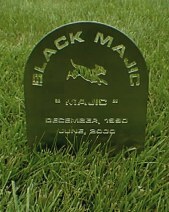 The pet grave marker pictured at left is only one example. It was produced for our company President when his long-time companion passed away. This is a lasered item made from heavy gauge stainless steel and brush finished. It will last for eternity. An item like this has to have art work made up; then designed, programmed, lasered, and finished. An item like this would start around $100 and go up from there, depending on what you wanted on it. This is only an example. If you can imagine it, we can probably make it.